This Fresh Blueberry Coffee Cake is the best blueberry coffee cake recipe. It’s a sour cream coffee cake with fresh blueberries inside the cake. 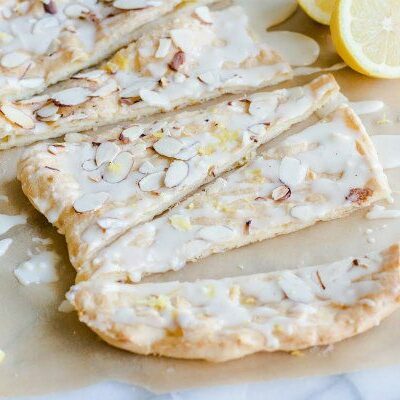 And it’s topped with a simple glaze flavored with vanilla or almond. 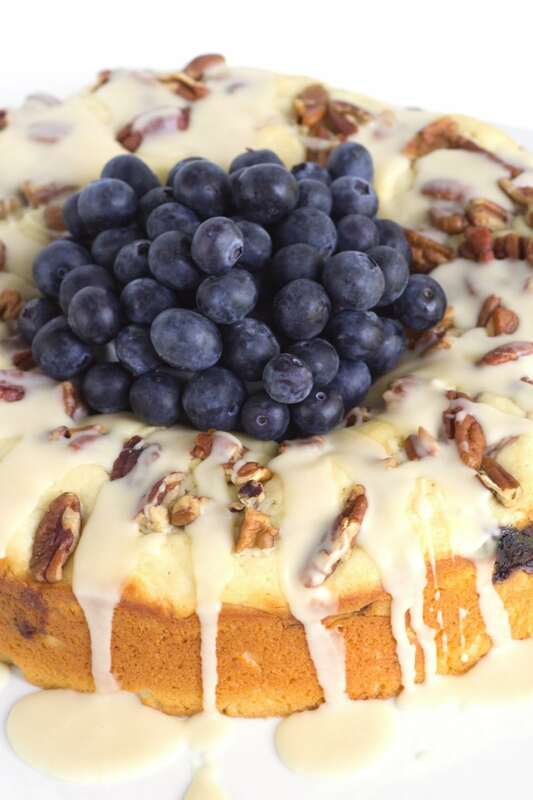 Fresh blueberry coffee cake can be made in a tube pan or a bundt pan. I like to make it in a tube pan because it gives it a cleaner look with the blueberry layer inside the middle of the cake. But it’ll work both ways. 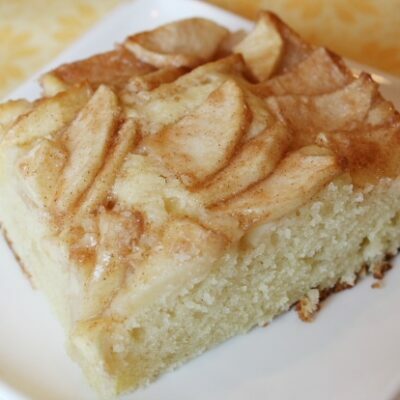 When you take this cake out of the pan, invert it from the pan onto a rack and then place a plate on the bottom of the cake and turn it to invert it onto the serving plate. Then you can add the glaze. 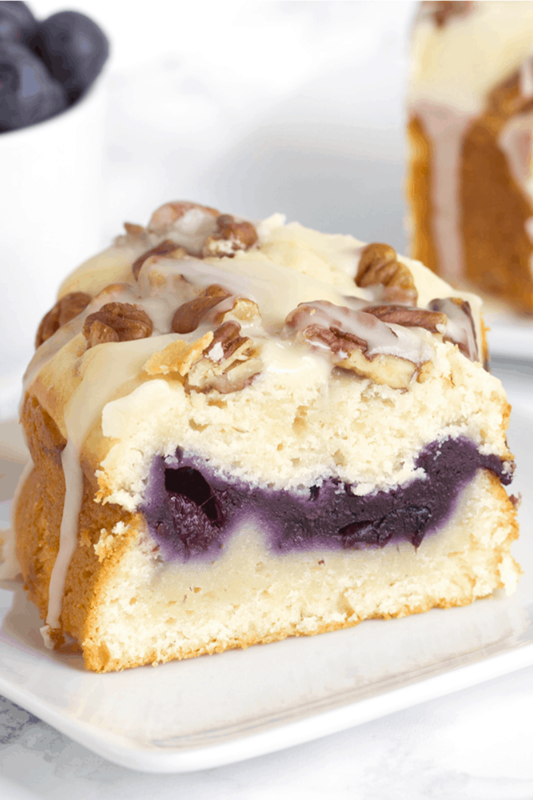 This is a lovely coffee cake with a fresh blueberry layer tucked inside. A sweet glaze tops the cake with toasted almonds or pecans too (if desired). 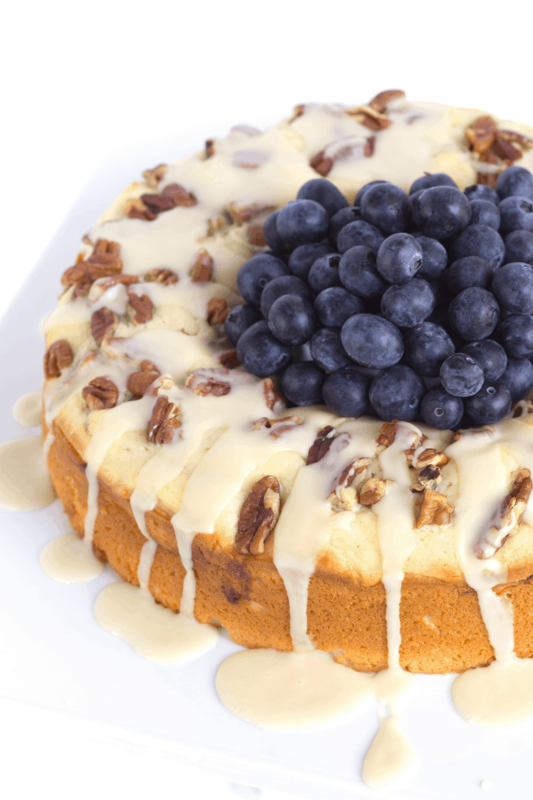 You can pile more fresh blueberries into the middle of the cake to add some color to your cake on display. 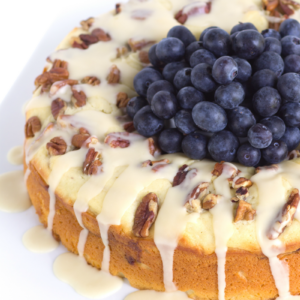 Plus, the addition of blueberries on top gives your guests a hint as to what kind of cake you’re serving! 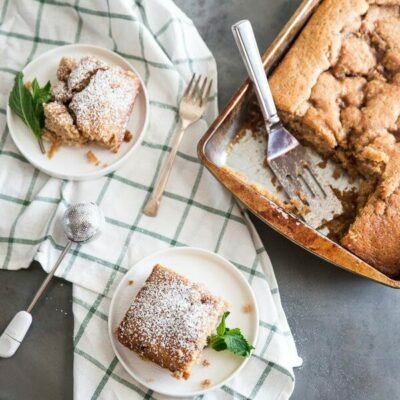 If you’re looking for a special morning cake to share with relatives or brunch guests, this is a good one. It just turns out so pretty with all of the fresh blueberries. Can I use frozen blueberries in this Fresh Blueberry Coffee Cake? Yes, you can use frozen blueberries in place of the fresh blueberries. Just thaw the blueberries and proceed with preparing the blueberry layer as directed. It should turn out just fine. 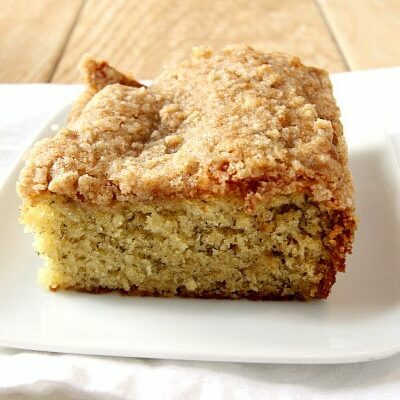 Although it’s always best when made and served the same day, coffee cake can be frozen too. Just wrap it well, and thaw it out when ready to serve. I’d wait to put the glaze on until serving day. Delicious sweet breakfast treat using fresh blueberries! Preheat the oven to 350 degrees F. Spray a tube pan with nonstick spray. In a small saucepan, combine the blueberries, 1/3 cup sugar and cornstarch. Cook over medium heat 5 to 6 minutes, or until thick- stirring constantly. Remove from heat and set aside. In a large bowl, use an electric mixer to combine the butter and sugar. Add the eggs one at a time, beating well after each. In a separate bowl, whisk together the flour, salt and baking powder. Add to the butter mixture beating it in alternately with the sour cream. Stir in the extract. Spoon half of the mixture into the prepared pan. Spoon the blueberry mixture on top of the batter. Add the remaining batter on top. Sprinkle with pecans or almonds, if using. Bake 50 minutes. Let stand 5 minutes before removing from pan. Place on a serving dish. Whisk the glaze ingredients in a small bowl. Drizzle over top of the cake. I mixed fresh blueberries, cornstarch and sugar together and cooked on medium heat but the mixture wanted to burn , should there be some lemon juice or water added to the mixture. Hmmm, blueberries should cook down with the sugar & no liquid needed. I wonder if it was too hot? I made this today – it was very good, though I am not a fan of sour cream. My family likes it, so I will be making it again – but I think next time I’ll try subbing plain full-fat greek yogurt for the sour cream. I made it exactly as written this time, and the amount of filling and glaze was perfect, in my opinion. Nice cake, and a very pretty presentation! I’ve never tried to freeze it, so I’m not sure! I slide a plate under the pan and pop it out onto the plate. What can you substitute for the sour cream as I hate the stuff and never use it. You can try using Greek yogurt. Video shows putting all the blueberry mix in middle of cake. The instructions says to put 1/2 with the remainder going on the top and then swirling. Which way please. I want to make this but not mess it up. You can put it all in the middle. No need to swirl unless you’d like to try and swirl it. I don’t have a tube pan, would a regular spring form pan work? Recipe states to sprinkle with pecans before baking . Photo shows the nuts on top. They are sprinkled on top… they just stay on top of the batter while baking. I just made this cake and it is delicious! I omitted the drizzle at the end and it was amazing. Definitely a keeper. Has anyone made this cake with gluten free ingredients? I would appreciate knowing the substitutions that were made. It looks yummy! probably- or some other kind of berry! Absolutely delicious – wow!!! This cake turned out perfectly and everyone just loves it. I also opted for frozen blueberries, mainly because they are very much out of season at the moment. Despite the substitution, everything worked well. I ended up with a moist, satisfying cake that I am proud to serve. Thank you!